One of the biggest threats to an open Internet — an absolute necessity for small businesses and innovative startups — is happening right now. At stake is whether the Federal Communications Commission (FCC) will approve a pay-to-play “fast lane.” If they do, large companies will be able to pay for faster and more reliable delivery of their content, literally crushing any competition. If you do anything online, this affects you. If the FCC approves a “fast lane” it would mean that big corporations would have greater influence over your Internet experience and your ability to access information. One obstacle to true public discussion of these implications is that the phrase “net neutrality” has such a PR problem. It is boring! Comedian John Oliver recently discussed net neutrality — or as he suggested naming it, “Preventing Cable Company F**kery” — on a recent episode of Last Week Tonight. As Oliver succinctly observed, “If you want to do something evil, put it inside something boring. (10:15).” He brings some humorous PR to the issue in the clip below. Right now, in terms of Internet access, our clients’ blog media is judged on par with content produced by any other competitor, including larger companies. This gives equal exposure potential to all parties and allows our clients’ content and brand message to compete on merit. From a consumer perspective it means a better product or solution can easily be researched and discovered. In fact, online visibility is one of the strongest reasons business blogs are so successful (read our newly released free guide on the topic: 15 Benefits of a Powerhouse Business Blog). Acme Widget, Inc., makes the best widget. Right now Acme widgets are sold online and outsell a similar product produced by Big Widget four to one. Big Widget doesn’t like this. 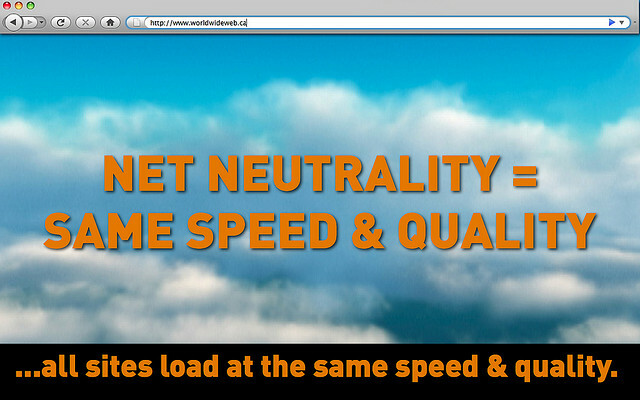 So, Big Widget purchases the right to a “fast lane” from their Internet Service Provider (ISP). Since there are so few ISPs — a virtual monopoly — this slows down the relative speed to Acme Widget’s website and apps. Now, information about Big Widget widgets dominates all results. In fact, now Acme widgets don’t appear in searches at all. It is as if Acme Widget never existed. People should be able to access any Web content or apps they choose without restrictions or limitations imposed by their ISP. Discrimination Against Your Product or Service. If a competitor with deeper pockets wanted to eliminate or impede your visibility online, they could. This could include content marketing/brand journalism media efforts that support sales. Limited Content Diversity. Nevermind that you don’t want your access to Internet content limited; brand journalism relies on the fluid exchange of ideas and news. Shutting off the pipes and allowing just a trickle of news and ideas would severely limit creative expression and economic growth. Limited Communication Options. Content marketers are quick to use and experiment with new technologies to connect with customers. That would be severely limited if established, well-funded services intentionally blackballed threatening startups. Do you really think your phone company is happy you’re using Skype and Facetime? These are just a few of the possible ramifications if the FCC allows a pay-to-play-faster model. It would be disastrous for innovation, civil liberties, and economic/cultural growth. Currently the FCC is inviting public comments on this proposed change. Make sure the FCC hears you by adding your voice at the official site (fcc.gov/comments), or more easily through DearFCC.org. Please share your thoughts below, or connect on Twitter using #noslowlane.